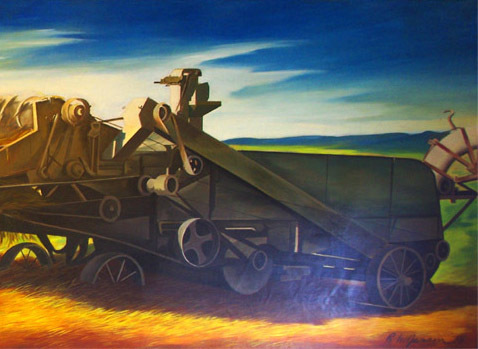 Featured Mural - Threshing Grain "Threshing Grain" was painted by Richard H. Jansen in 1938. The mural measures 14' wide by 4'6" high with a total approximate area of 63 square feet. Jansen used the medium oil on canvas, and completed the mural in 232 calendar days. Postmaster J.F. Seagle announced in the Lincoln County News the mural's placement in the west end of the building and its depiction of a rural Lincoln County's scene. On Wednesday, August 10, 2005, the Lincoln County Historical Association, U.S. Postal Service, and members of Lincoln County's arts and cultural community gathered at the Lincolnton Post Office to rededicate the "Threshing Grain" mural painted by Richard H. Jansen. The dedication commemorated the artistic merits of the mural's artist, the conservation efforts of the Association and the numerous project contributors, and the attendance of the artist's stepson, Henry DeMeritte. Organizers and participants celebrated the hard work, dedication, and commitment art, history and preservation exhibited by the Association's staff, board of directors, and volunteers. Sparked by the interest of an inquisitive Lincolntonian, the Association successfully preserved for posterity one of nation's most cherished works of public art. During 2000, Lincolnton newcomer Mike Ottinger took notice of the faded mural while standing in line in the Lincolnton Post Office. Participating in Leadership Lincoln, a joint program between the Lincolnton-Lincoln County Chamber of Commerce and Gaston College, Ottinger became very interested in Lincolnton and Lincoln County history, specifically the post office mural. He contacted museums, libraries, and family members in Madison, Wisconsin, home of the artist, Virginia, and Washington, D.C. After three months of extensive research, Ottinger submitted an article to the Lincoln Times-News outlining the U.S. Postal Service's New Deal Arts Collection, the mural's subject, a short biography of the artist, and information on the artist's later works. Lincoln County received Ottinger's article with open arms, but failed to take the project to the next level: restoration. Over the next three years, Mike Ottinger became a very active member of the Lincoln County Historical Association and discussed the mural and its restoration with Association executive director Jason L. Harpe. After much discussion and planning, Harpe contacted Dalan Wordekemper, U.S.P.S. Federal Preservation Officer, in November 2003 to inquire about the proper steps to begin the process of restoring the mural to its original state. Wordekemper contacted Doris Reed, Lincolnton Postmaster, to explain to the project and its significance, and delegated the leadership of the project to Harpe and Reed. Harpe consulted with two conservation firms for quotes on the mural's restoration and decided in favor of Parma Conservation of Chicago, Illinois. After the initial visit from staff of Parma Conservation, Harpe began the fundraising effort to raise $6,400 to properly restore the mural. Between January and August 2004, Harpe and the Association successfully raised the necessary funds. Thanks to a $3,400 contribution from the U.S.P.S. and contributions from over 20 individuals and businesses in Lincoln County, Parma Conservation began the restoration in August 2004. Mural Mention#1 - The Iron Furnace Joe McKinney painted the mural on the east side of the Lincoln Times-News building in 2017. This project was supported by the City of Lincolnton, and spotlights iron production, the first big industry in Lincoln County. Mural Mention#2 - Marcia Cloninger Rail Trail Train Ty Hobson painted the mural on the west side of the Anderson Building in 2015. This project was supported by a fa�ade grant from the City of Lincolnton, a grassroots grant from the North Carolina Arts Council, and John Anderson, the building�s owner. The mural features three train cars spotlighting textiles and Catawba Valley pottery. "Threshing Grain" was painted by Richard H. Jansen in 1938. The mural measures 14' wide by 4'6" high with a total approximate area of 63 square feet. Jansen used the medium oil on canvas, and completed the mural in 232 calendar days. Jansen painted "Threshing Grain" in his studio in Milwaukee, Wisconsin. The mural was later transported on canvas to Lincolnton by train. The subject matter has a local theme. In a handwritten letter dated September 18, 1937, Jansen suggested an agricultural theme "...as I felt I couldn't go wrong, since the town is certainly bound up with the county around it." Though grain was and still is cultivated in Lincoln County, one must speculate the wheat grown in Wisconsin and the Great Plains influenced Jansen's creative process. Jansen received $610 for painting the Lincolnton mural. On June 9, 1938, Postmaster J.F. Seagle announced in the Lincoln County News the mural's placement in the west end of the building and its depiction of a rural Lincoln County's scene.